Airtime and SIM card vendors will have to look elsewhere for income after the national communication regulator banned the practice, arguing that it is one way of fighting crime. Mr Godfrey Mutabazi, the Uganda Communications Commission(UCC) executive director, told journalists on Friday that anyone seeking to trade in airtime and SIM cards must be duly licensed by UCC, and must be known to the service provider. “From now on, we shall not allow any hawkers of communication gadgets before the implementation of new improvements. We have introduced card readers where all cards will have to put in their particulars,” Mr Mutabazi said. He added that all mobile phones on sale will be registered. The move follows a cabinet directive to regulate the use of mobile phones and SIM cards that are increasingly used by criminals. The latest crime is the kidnap and murder of Susan Magara, a 28-year-old cashier, where it was reported that criminals used more than 20 SIM cards, which they kept alternating between different phone handsets. Last week, President Museveni, in a condolence message to the Magara family instructed that the process of photocopying identity cards should stop forthwith and intead card readers should be used at point of sale of simcards. Mr Mutabazi told journalists on Friday that it is only in Uganda where simcards are vended and said this was going to stop with immediate effect. He asked Ugandans to worry about safety and life before thinking about the future of the vendors who have been put out of business. The communications boss said telecom companies were going to partner with the regulator to establish API connectivity which will enable a person trying to acquire a simcard to have their National Indentity Card details captured and verified. “This process should not take less than 48 hours. There should also be a second level verification process, just like when one opens a bank account,” Mr Mutabazi said, urging Ugandans to adopt to the new system which will also ensure safety of their details. He added thatUgandans should know that a lot of their personal information is now going to be captured in the simcard system. 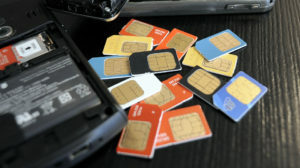 Prior to the press conference, telecoms on Thursday announced that they had stopped selling new simcards until the process of establishing connectivity with NIRA is complete. According to a statement by MTN Uganda, the company informed the public of new guidelines issued by Uganda Communications Commission with regard to selling of new Sim cards. “MTN together with other Telecom companies have been advised to immediately cease the sale of new SIM cards through hawker street vendors, or any other sellers that are not licensed by Kampala capital authority or other Municipal Authorities,” read in parts. Africell Uganda also halted their agents from selling SIM cards through vending and hawkers until the verification exercise by UCC is complete. Africell has today Thursday Joined MTN to respond to UCC’s ban regarding the sale of lines. “Following a directive from UCC [Uganda Communications Commission], we inform the public that sales/distribution of SIM cards has been halted until UCC establishes API connectivity with NIRA [National Identification Registration Authority] for National Identity verification,” Africell Uganda Twitted. Yesterday, UCC also issued a one month ultimatum for all online content providers to register with the commission or disciplinary measures taken against them.